Vaccination against feline AIDS is recommended but not required. While the diagnosis of AIDS -- even for felines -- conjures up less than lively images, the good news is that effective and relatively inexpensive vaccinations are readily available to protect your feline friend from this disease. Knowing more about its transmission is a motivator to vaccinate. Feline AIDS is also known as the feline immunodeficiency virus. It mirrors the human version in that it can take years after exposure before symptoms emerge. VetInfo explains that feline AIDS attacks the cat's immune system by allowing bacteria, fungi, parasites and other viruses to worsen a cat's health. Similar to human AIDS, the feline version weakens the immune system, leaving it useless to fight off secondary infections. While its mechanisms and effects are similar to human AIDS, feline AIDS is not transferable to human companions. There are two methods of transmission -- both of which involve exchange of body fluids. The first is through bite wounds. VetInfo explains this is most common with cats living outdoors that most likely have not been vaccinated. This is the perfect reason to keep your feline friend indoors. Male cats attempting to protect their territory via fighting are more likely to sustain a bite wound and therefore potentially at greater risk for exposure, according to PetPlace.com. The second method of transmission is from mother to kitten. Kittens can acquire the virus if it is present in the mother's breast milk consumed by the growing youngster. Birth fluids of a mother cat with feline AIDS can also put a kitten at risk as he is born. VetInfo qualifies the transmission from mother to kitten as less common, but still a possibility. Detecting feline AIDS via symptomatic expression only can be tricky, as many of its symptoms are associated with other ailments. Describe any symptoms you detect to your veterinarian in an effort to err on the side of caution. Common symptoms of feline AIDS include: enlarged lymph nodes, fever, anemia, weight loss, a disheveled coat, poor appetite and diarrhea. Other symptoms include inflammation of eyes, gums or mouth as well as other dental disease, wounds that will not heal, sneezing and even behavioral changes. Blood testing is the only way to verify if a cat has feline AIDS. In veterinary terms, two different tests known by acronyms -- ELISA and IFA -- are used to confirm the diagnosis. The ELISA test, which stands for enzyme-linked immunosorbent assay, searches for the AIDS antibody in the blood. The IFA test, which stands for indirect fluorescent antibody, is often used as a backup to reconfirm the ELISA test. The IFA test uses a combined mixture of the feline AIDS antibody and a fluorescent compound that is put in a sample of the cat's blood. If the blood fluoresces under ultraviolet light, the result is positive. Unfortunately, there is no cure for feline AIDS once a cat has acquired the virus. With proper care and disease management, PetPlace.com indicates some cats live up to 10 years post diagnosis. This requires a commitment from you to closely monitor the cat's health. Cornell University College of Veterinary Medicine recommends keeping infected cats indoors and away from other felines, feeding a nutritionally complete diet that does not include raw products and taking Kitty for regular wellness exams. 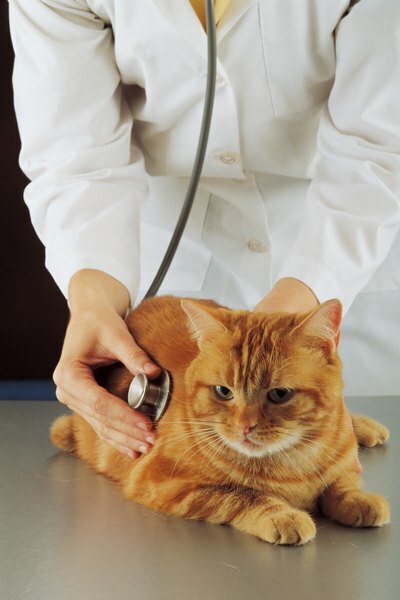 VetInfo: What Is Feline AIDS? What Causes AIDS in Kittens?